I’ll just call out the elephant in the room: Middle Grade book subscription boxes are HARD to find (requesting a small business loan in 3… 2… ) But you’re not a real blogger until you review an in-genre sub box. So here goes the BookCase Club Preteen box for March 2019. I wanted to go with a books-only box for my first pass, just because I want the next major book swag I get to be my own. I specified Preteen (which I assumed, apparently correctly, to mean upper Middle Grade) and my gender. This is the longer and “heavier” of the two books, JOURNEY’S END looks like a Scottish preteen Rip Van Winkle x creepy local legends about wormholes. I loved Hawkins’ YA Hex Hall series, and grew up in a town with a few paranormal mysteries too many. I’ll probably read this one first. The town of Journey’s End may not literally be at the end of the world, but it sure feels like it to Nolie Stanhope. Spending the summer with her scientist father in the tiny Scottish village isn’t exactly Nolie’s idea of a good time, but she soon finds a friend: native Journey’s Ender Bel McKissick. While Nolie’s father came to Journey’s End to study the Boundary–a mysterious fog bank offshore–Bel’s family can’t afford to consider it a threat. The McKissick’s livelihood depends on the tourists drawn by legends of a curse. Still, whether you believe in magic or science, going into the Boundary means you’ll never come back. This looks like a good pool read (neighbor kids think my house is haunted as it is, so why not go with it?). What I skimmed does seem to have Neil Gaiman’s funny/dark vibe going on. A street-smart kid raised by quarreling crows and critical of humanity’s weirdness, is definitely something I can get behind. Ferals is the first book in a dark, action-packed trilogy that’s part The Graveyard Book, part Batman, and all high-octane adventure. Blackstone was once a thriving metropolis. But that was before the Dark Summer—a wave of violence and crime that swept through the city eight years ago, orchestrated by the fearsome Spinning Man. Now the Spinning Man is on the move again, and a boy named Caw is about to be caught in his web. Caw has never questioned his ability to communicate with crows. But as the threat of a new Dark Summer looms, Caw discovers the underground world of Blackstone’s ferals—those with the power to control animals. Caw is one of them. And to save his city, he must quickly master abilities he never knew he had . . . and prepare to defeat a darkness he never could have imagined. Two out of three isn’t bad: I had pre-ordered this one way back when since I’m friendly with Debbie through SCBWI and figured (correctly) Abby would have a great voice and pace. To note, Abby (like Debbie!) is Jewish; it’s not a major theme. THIS IS NOT THE ABBY SHOW is billed as for fans of Meg Cabot and Joey Pigza, which is accurate, but Fischer goes a bit deeper into family dynamics and Abby’s self-reflection than Cabot or Gantos. Also, THIS IS NOT THE ABBY SHOW educates the reader about ADD/ADHD more than any other book I’ve run across. Abby was born for the spotlight. Now it’s her time to shine! Abby is twice exceptional—she is gifted in math and science, and she has ADHD. Normally, she has everything pretty much under control. But when Abby makes one HUGE mistake that leads to “The Night That Ruined My Life,” or “TNTRML,” she lands in summer school. Abby thinks the other summer-school kids are going to be total weirdos. And what with her parents’ new rules, plus all the fuss over her brother’s bar mitzvah, her life is turning into a complete disaster. But as Abby learns to communicate better and finds friends who love her for who she is, she discovers that her biggest weaknesses could be her greatest assets. Hilarious and heartwarming, This Is Not the Abby Show is for everyone who knows that standing out is way more fun than blending in. This book came out in 2016 from Delacorte Press, and I had pre-ordered it since it looked good and I’m friendly with Debbie through SCBWI. I MUCH prefer the library binding on this copy to the first edition’s canvas book and dust jacket, but my original copy is signed, so this one is going into my #KidsNeedBooks pile. Verdict: What will really hit me is not something I can quite quantify, but this was a good mix. At $15 for three nice new books, I renewed for another month. 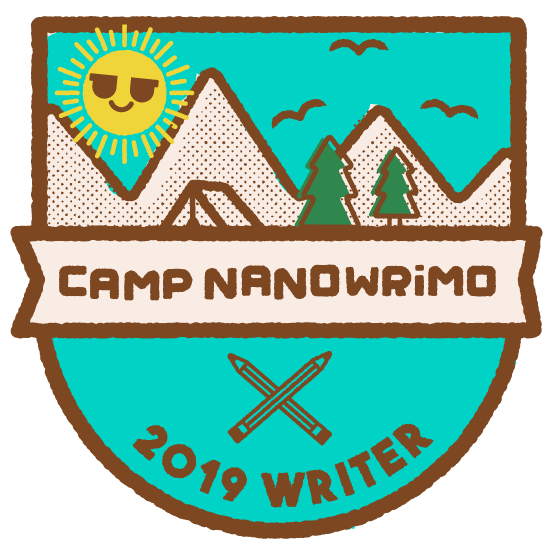 Previous Camp Nanowrimo: Let’s do this!